London-based contemporary artist Nassar Azam was inspired by the Sir Duncan Rice library. 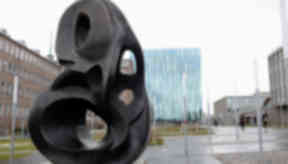 A 20ft-tall bronze art sculpture that celebrates the old and the new has been unveiled at the University of Aberdeen. The piece, entitled Evolutionary Loop 517, which was created by London-based contemporary artist Nassar Azam, takes pride of place at the entrance to the Sir Duncan Rice library. The £57m library, which was officially opened by the Queen and the Duke of Edinburgh last September, was a source of inspiration for the artist when working on his masterpiece. Nassar worked closely with the architect of the library, Morten Schmidt, a founding partner of the award-winning Scandinavian architectural practice Schmidt/Hammer/Lassen architects, who have designed some of Europe’s most groundbreaking library buildings. The sculptural forms of Evolutionary Loop 517 reflect the surrounding buildings and landscape. Nassar added: "The project has been most rewarding as I was involved with the architects from the outset. "Evolutionary Loop 517 to me reflects the visually striking interior design of the library and the use of bronze cements a strong connectivity between the historic relevance and traditions of the university, and the bold and beautiful statement of the contemporary library building." Despite having the working title Eclectic Grace, staff and students were challenged to name the sculpture to reflect the community and its surroundings. The winning entry came from chemistry Professor Marcel Jaspars, who explained where the inspiration for his name choice came from. Professor Jaspars said: "I chose the name Evolutionary Loop 517 to reflect the fact that students, academics and staff are constantly evolving in their experiences and connections at the University of Aberdeen, to show the organic nature of the sculpture in symbiosis with the research carried out at the university and to represent the age of the University when this sculpture was made. "In a diverse way, we will all have a connection with the University of Aberdeen just by looking at the sculpture. In future years, maybe people will simply say, 'Let's meet at the Loop'. "I came up with the name as I felt this is a very organic piece, and the intertwined forms connect in a loop, which reminded me of the evolutionary process, with continuous change and connection. "I feel very proud to have named such a monumental piece and am happy in the knowledge that the name I chose will be associated with this piece forever. I spent some time watching the installation of this piece in different light conditions, and found the sculpture awe-inspiring." Dr John Sievrwright, who donated the piece to the university, welcomed the new landmark to its campus, at a ceremony on Monday. Chris Banks, university librarian and director of library special collections and museums, added: "I am thrilled that the sculpture is now taking pride of place in front of the library. "We are extremely grateful to the donor who commissioned the piece and also to Nasser who has created this stunning piece of art for us." Azam has also finished a large painting, entitled Loop, reflecting on the relationship between sculpture and architecture. Loop has entered the collection of the university and will be hung in the new library building.